Distracted drivers are not difficult to spot. Cell phones are the newest culprit, but fast food, coffee, makeup, cigarettes, and countless other distractions can also cause a person to drive erratically. At Corsiglia McMahon & Allard, L.L.P., our experienced car accident attorneys represent victims of distracted driving accidents. We are aggressive trial lawyers who know how to hold negligent drivers accountable for the harm they cause. To schedule a free consultation to discuss your case, contact us at (408) 289-1417. You will not pay legal fees unless we obtain compensation for you. According to the National Highway Traffic Safety Administration (NHTSA), as many as one in five accidents that cause injuries involve reports of distracted driving. One study showed that using a cell phone while driving had the same impact on a driver's reaction time as being legally drunk. 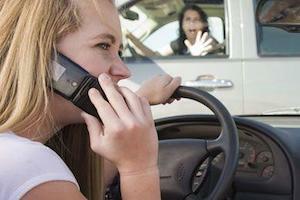 Across the country, states are working to pass laws against text messaging while driving. It is an unsafe practice that poses a threat to drivers everywhere. If you or a loved one was hurt by a driver who was texting, it is vital to seek full compensation for the harm done to you. Distracted driving is negligent driving. By holding negligent drivers accountable, we hope to make the roads safer for everyone. While texting is one of the most common sources of distraction, it is not the only form of negligent conduct engaged in by drivers. A driver who causes an accident because he or she was reading a map or talking to passengers in the car is also guilty of distracted driving. We have extensive experience in dealing with car accident matters. We will present a compelling case to insurance companies, judges, and juries to help our clients get the compensation they deserve. If you were injured in a car accident, you should speak to one of our dedicated attorneys as soon as possible. Contact us at (408) 289-1417 to schedule a free initial consultation. Our law firm represents clients in Bay Area cities such as Palo Alto, San Jose, Santa Clara, Cupertino, and Los Gatos.